← Why does the Moon have phases? Can a nymph, an Amazon, a playwright, and a poet bring peace to Athens? “Before the comedies were presented at the festival, it was customary for one of Athens’s great lyric poets to entertain the crowd with a few well-chosen pieces, to get them in the mood. As with everything connected with the festival, it was an honour to be selected. “It’s not fair,” said Luxos. “It’s not fair” isn’t, by any means, a new statement, and even in 421 BC, it was unlikely to be original. So why would Aristophanes, also known as the Father of Comedy, waste his valuable time on an untried poor guy with no formal training, connections or credentials, when he desperately needs the best actors, props and an acclaimed poet to win the first prize with his controversial play Peace? The role of an Artist at wartime is a deep question, and Martin Millar could have used the backdrop of Dionysia festival during the Peloponnesian War to explore the topic for a few hundred pages, adorning his premises with a plethora of historical information and elaborate literary contemplation. Luckily for me, the characters in the novel have much more to do than lament the hardships of artists in a materialistic society hardened by a decade-long war. Meet Laet, the granddaughter of Eris, goddess of strife, discord, and war, and the daughter of Ate, the spirit of delusion, infatuation, and reckless folly. People in Laet’s vicinity are bound to do precisely the wrong thing. Unpleasant consequences during the crowded Spring festival are pretty much unavoidable, but the situation could quickly deteriorate if Laet extended her influence to the participants of the ongoing peace negotiations between Athens and Sparta. But this is exactly what those who oppose to the peace talks want, and they are ruthless enough to pay Laet and her formidable bodyguard to come to Athens, to play havoc with the talks, and to ruin Aristophanes’ play. In the face of such foes, even the famous playwright’s genius might not suffice, that is, if he survives to stage the play on the final day of the festival. Since both the outcome of the peace negotiations and of the comedy competition are historical facts, the novel introduces decent people who might be able to thwart the ploy of the “bad guys”. The self-proclaimed poet is a good candidate (aren’t poor orphan lads of humble origin always so? ), but he isn’t a match for high-born citizens, who snub and ridicule him. Even the famous Aristophanes needs the help of more powerful allies. Enter Bremusa, a fierce Amazon warrior who had lived for the last eight-hundred years on Mount Olympus, and Metris, a flighty and talkative nymph whose healing powers are supposed to counter Laet’s disastrous influence. Can this strange pair be a match for Laet and her bodyguard? Nothing is obvious, except of the fact that the young nymph was not entirely honest about the extent of her powers. 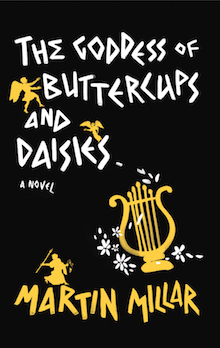 The Goddess Of Buttercups And Daisies takes place around historical events and famous figures of that time, but more importantly it is fun to read. The writing is so seamless that I forgot I was reading. Somehow, I was there, right beside Aristophanes, following his progress as he labored to make the production work while agonizing about sabotage and the better funding that his competitors were receiving. I watched the poet discover love, and eagerly followed the young nymph and the grumpy Amazon throughout their mission. Visiting the Altar of Pity made me pause; being reminded that victory requires sacrifice left a bittersweet aftertaste in my mouth. As a reader, I enjoyed the mix of adventure and wit, sword fights intertwined with budding love, tales of treachery not overburdened with social commentary. As a writer, I appreciate the mastery of storytelling, prose that does not seek attention yet is as precise as Bremusa’s sword and as magical as Metris’ flowers. Highly recommended. ﻿To tell of sunny hours. ﻿Spring up here and there. What to them is winter! ﻿And patient hearts to bear. This entry was posted in fiction, humor, literature and tagged Ancient Greece, Athens, book review, comedy, goddess, historical fiction, Martin Millar, mythology, satire. Bookmark the permalink.